Vienna University of Economics and Business (WU Vienna) is reportedly the biggest business school campus in Europe. 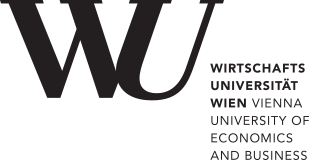 The Department of Information Systems and Operations at WU Vienna was founded in the course of WU’s organizational restructuring in 2005. Since then, it has consolidated the know-how and reputation of five highly renowned institutes and 16 professors with distinguished focuses in research and teaching, providing a broad representation of IS research topics. Our Bachelor’s Program in Information Systems is recognized as Austria’s leading degree programs in this field (according to Format Uni-Ranking, 2009). The recently-established Master’s Program in Information Systems (launched in winter semester 2013/14) ambitiously attempts to follow in these successful steps. Vienna University of Economics and Business is ERCIS member since 2004.